View More In Paper Racks & Chart Stands. Multi-Pocket Wall-Mount Literature Systems 18-1/4w x 23-1/2h Clear/Black - Plastic pockets are virtually unbreakable and feature the exclusive spring-action design of the Stand Tall break-resistant tongue that secures literature upright. - One-piece unit. - Mounted on black panel. - 2 5/8" capacity per pocket. - Predrilled for wall mounting (hardware included). - Color: Clear/Black Overall Width: 18 1/4" Overall Depth: 2 7/8" Overall Height: 23 1/2". 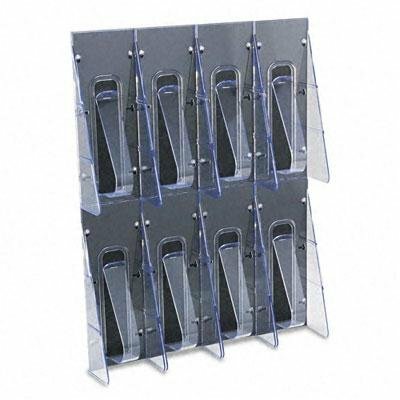 Safco - Onyx Magazine Floor Rack 12-1/2W X 13D X 26-3/4H Black "Product Category: Office Furniture/Display Racks & Cases"
Safco - Solid Wood Wall-Mount Literature Display Rack 11-1/4W X 3-3/4D X 24H Mahogany "Product Category: Office Furniture/Display Racks & Cases"